King County monitors the ecological health of Kelsey Creek in a variety of ways, including collecting and analyzing water, sediment, and benthic invertebrate samples. Water quality samples have been collected monthly from two sites along on the creek. Station 0444 (previously referred to as Mercer Slough in some reports) is located at the mouth of Kelsey Creek at the gaging station located off Interstate 405 and under the trestle near the Richards Road exit. Sampling at this site began in 1977 and continued until 2008 when budget cutbacks forced King County to reduce the breadth of its water quality monitoring program. Regular monitoring at this site resumed in 2013. Station D444 is located at the footbridge in the northeast quarter of Kelsey Creek Park and was sampled for water quality from 1977 - 2008. Sediment samples have been collected from Kelsey Creek as part of the Streams Sediment Monitoring Program starting in 1987. 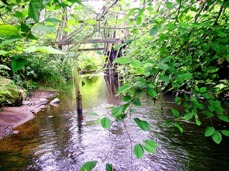 King County began collecting benthic macroinvertebrate samples in Kelsey Creek in 2002. From time to time, additional studies have been conducted on Kelsey Creek. Click here for more information about Special Studies. The Kelsey Creek basin comprises approximately 10,870 acres and has several streams draining west into the east channel of Lake Washington at Interstate 90. The basin includes over 19 miles of open stream encompassing Mercer Slough, Sturtevant Creek, Kelsey Creek, Valley Creek, the West Tributary, Goff Creek, Richards Creek, East Creek, and Sunset Creek. The mainstem of Kelsey Creek originates in the Phantom and Larsen Lake wetlands. Historically, the creek originated from Phantom Creek and Phantom Lake, but early pioneers redirected the Phantom Lake outlet to Lake Sammamish in the late 1880s (KCM, 1993). Total land use in the Kelsey Creek basin is mostly developed. There is some forest and no agriculture. The remaining land use is scrub, wetlands, and other (open water). Development consists of low to high intensity, low being the most common, and open space. The basin is considered to have reached built-out conditions, so future development will predominantly be redeveloping existing properties. Additionally, Kelsey Creek Park, within the central part of the City of Bellevue, Washington, encompasses 150 acres of forest and wetland habitat. See Table 1 below for more details on land use. The suitability of Kelsey Creek for salmonids was rated as "fair" overall in 1989 (Metro, 1990). Impacts from high stormwater flows and sedimentation were cited as the primary factors for declining conditions. Numerous hydrology studies have been done on Kelsey Creek. The University of Washington evaluated the hydrologic impacts of human development in the Kelsey Creek basin using historical land development patterns (Richey et al, 1981). They found that the monthly average volume of flow had increased only slightly with urban development, but the storm peaks increased two to three times over the same historical period (Kerwin, 2001). The City of Bellevue now operates six in-stream, regional detention facilities. Volunteers with the Salmon Watcher Program observed salmon at various locations throughout the basin from 1996 to 2015. Chinook and coho salmon and trout were consistently observed in the basin ("Stream List," 2016). Less commonly seen were chum salmon. Issaquah Hatchery coho stock are planted at various life history stages throughout the basin (Kerwin, 2001). The City of Bellevue sponsored juvenile fish surveys in four of the sub-basins in 1996 and 1997 (Kerwin, 2001). In 1996, eight fish species were observed in the Kelsey Creek basin: cutthroat, coho, rainbow, sculpins, lamprey, dace, sucker, and bluegill. Coho were observed at all sampling locations, but numbers were low (averaging seven coho per 50-meter reach). Cutthroat trout were present in fairly high numbers in all sampling locations. Similar findings were noted when the study was replicated in 1997. State water quality standards were revised in 2003. Kelsey Creek is now categorized as “Core Summer Salmonid Habitat” for aquatic life use. As part of the updated water quality standards the creek has been assigned an additional “Supplemental Spawning and Incubation Protection” temperature criteria of 13 ºC to be applied from September 15th to May 15th. Kelsey Creek is designated as “Extraordinary Contact” for recreational use. Both sampling sites in Kelsey Creek are listed on the Washington State Department of Ecology’s (Ecology) 303(d) list for violation of water temperature, DO, FC bacteria, pH, and bioassessment standards (Category 5). A 25-year (1979 – 2004) trend analysis was conducted with baseflow water quality data showed some significant changes in the water quality since 1979. Water quality declined during this time period as indicated by significant increases in water temperatures and conductivity at both sampling sites. Other indications of declining water quality are a decrease in DO and pH at the mouth (0444) and an increase in nitrate-nitrogen upstream (D444). Decreased total suspended solids (TSS), and ortho-phosphorus at both sites indicate some improvements in water quality in the same 25-year period. In addition, ammonia and nitrate-nitrogen, and FC bacteria decreased at the mouth of the creek. A Water Quality Index (WQI) rating system was developed by Ecology that evaluates several water quality parameters and gives a single rating of “high,” “moderate,” or “low” water quality concern. To see how Kelsey Creek ratings compare with other stream sites, please visit the Water Quality Index webpage. King County maintains a stream gage on Kelsey Creek: City of Bellevue NE 8th Street crossing (38C). Sediment data were collected from Kelsey Creek as part of the Stream Sediment Monitoring Program from 1987 through 2002. Data analysis identified no significant trends for any of the parameters tested. Basin-wide sampling took place in 2007, including six sites along the Kelsey Creek reach. At sites F444, H444 and I444, concentrations of bis(2-ethylehexyl)phthalate (a ubiquitous chemical found in many plastics) exceeded the Sediment Cleanup Objective (SCO). Effects to sediment-dwelling animals are possible, but uncertain. At site H444, concentrations of arsenic, cadmium, and nickel also exceeded SCO. Site I444 had concentrations of dieldrin (an organochlorine pesticide) that exceeded the Cleanup Screening Level (CSL), which mean that adverse effects to sediment-dwelling animals are likely. Acid volatile sulfide/simultaneously extracted metals (AVS/SEM) analysis suggests that metals were not bioavailable at site H444 where metals exceeded guideline concentrations. For more information about benthic macroinvertebrates and King County’s Benthic Macroinvertebrate Program, please visit the King County Stream Bug Monitoring webpage. To see the benthic macroinvertebrate data for Kelsey Creek, please visit the Puget Sound Stream Benthos webpage.